Receive what comes to you. My plant spirit teacher taught me that plants that will heal me will come to me. All I need to do is receive. Receiving – coming into relationship and taking that in, however – takes a little preparation. Those of you who read my newsletter know that my family had quite a struggle through the winter with a life-threatening illness – happily we’re on the mend and the dark rider passed us by (sheesh!). Through that time I cut way back on work – we lived on air and the love of family and friends. We are resting and integrating that experience. This morning it dawned on me that my garden this year has serious messages for me and mine. This mullein plant (the tall fellow in the back) sprung up smack dab where my usual sunflowers gather. Hi mullein. Guess what mullein does, on the energetic level? It is protector of home and supporter of abundance, among other things. 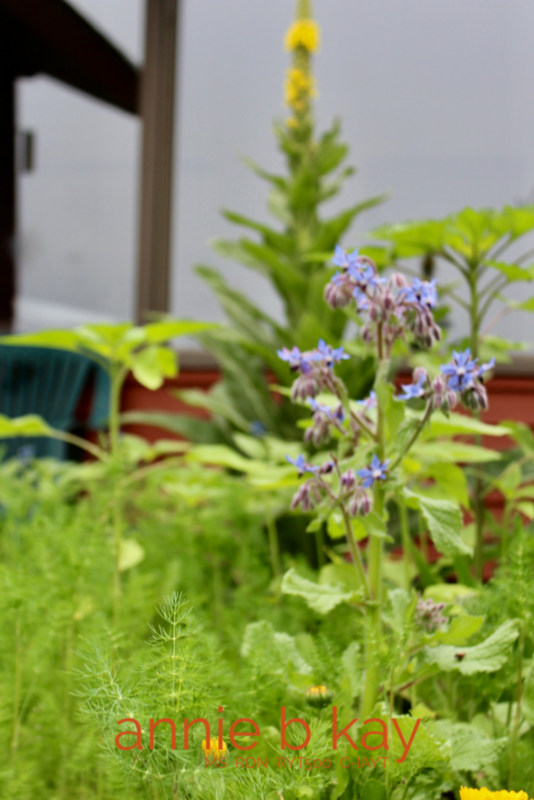 Other plants that have nearly overwhelmed us with no input from me are calendula – a beautiful healing fire plant (it’s the yellow-orange flower up front), borage (that blue fellow) a 5th chakra healer of communication for me, and dill. So much dill (again a protector of home an supporter of abundance). Oh, and a bumper crop of wild strawberries are right outside my office – food for my indigenous genetics. I could go on and on, but will stop there. These plants are three feet from my front door. All I have to do is receive their support. 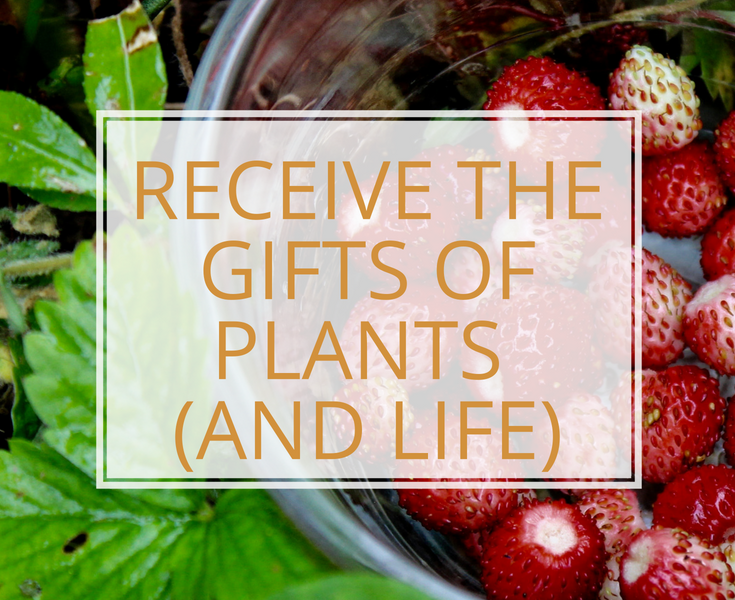 So, how do you receive the support of the plants that make their way to you? In order to participate in any ecological system (and plants belong to an ecological system along with you) meaning that there are complex dynamic inter-relationships, you first need to get out of a consumer mindset. 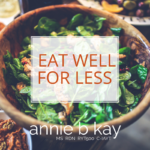 We humans and certainly Americans get into consuming – eating as fuel or in a mechanistic way, for example. Instead, think of a plant as another being. A person, if that’s helpful. Or think of them as akin to a power-animal or guide. You might thing of eating as receiving – rather than consuming. Then, get quiet and open your heart. One easy way to do this is to sit quietly, and lengthen and deepen you breath (without forcing it – let your breath deepen as in response to an invitation). You might imagine yourself seated in the velvety dark cave of your own heart. take a few moments to quiet and center yourself in this way. Next, make contact with the plants. Be among them, breathe them in. Admire them. If they are edible, slowly and mindfully, as a meditation, taste them. Breath and relax, and notice how it feels to commune with the plants in this way. The practice of receiving is simply the practice of being open and feeling how it feels to be in relationship. The practice of receiving is a practice of appreciation – of acknowledging, as my teacher would say, your place in the magnificent web of life and nature. All is well. As you receive the gifts these friends, these guides have for you, expressing gratitude is an excellent next step if it feels right for you. Take a moment to appreciate what’s happened, a few notes in a journal may be helpful, and off you go on a blessed day. 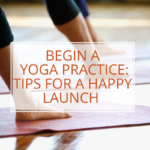 You can receive the gifts of any part of your life – be it your yoga or meditation practice, the love of a friend, the good work you do, anything you enjoy or find interesting or challenging in your life – can you receive it? Can you slow down enough to take it in? Learning to have a bit more of this in your life can help you to understand your place in the ecology – in the interactive web of life – in which you live, and that you have created. It may help you see aspects of life, or things in your life that no longer serve you or that actually injure or inhibit you. You can let go of those things. Learning to be a little more receptive can inform your next step. Vieques PR is an island about the size of Nantucket. One difference between these beautiful islands is that 50 years ago half of Vieques was cleared of long-term and indigenous residents and used as bombing target practice by the US military. Another difference is that in spite of its tortured history, Vieques is home to one of the most bioluminescent bays in the world. I’ve just returned from Vieques with a group of herbalists and healers who went to the island to communicate with the dinoflaggelate (pyrodinium bahamenses) occupants of the bay though a Shamanic practice we share called Plant Spirit Healing. In my newsletter this month I talked about this amazing little organism and the very specific ecology it needs to shine. The bay is calm, saltier than the ocean, and 4 different types of mangroves feed the dinoflagellates with a B-vitamin rich nutrient cocktail. There have been periods of time when the ecology got disrupted when the bioluminescence didn’t happen. I can relate! Spending time with the these little guys, who need lots of darkness and agitation to be observed (remind you of anything?) got us all exploring what we each and collectively need, in order to bioluminate (which humans do!). 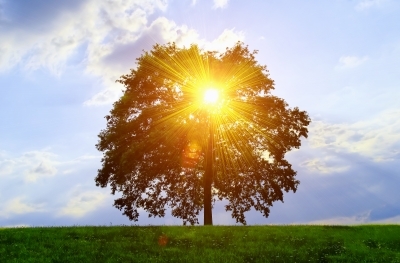 What is the ecology surrounding and including you, that you need in order to shine? As we pondered this together, and did Shamanic journeys and shared in sacred circle, we each reported what we need to be our full selves. As we shared together, something familiar (to those who hang out in spiritual spaces) happened. We bonded and elevated. It feels like falling in love. It is falling in love. To complete our time together, we created a Shamanic landscape. 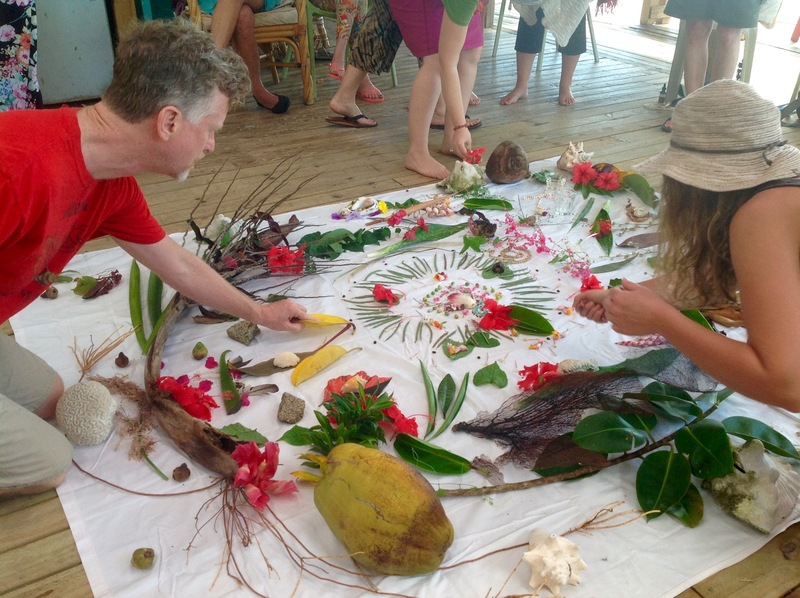 This is a mandala-like natural work of art/prayer that includes all the plants each of us connected with and the flowers we enjoyed. It represents the collective energy of each of us who gathered together for this week in the sun. As you can see, it’s beautiful. 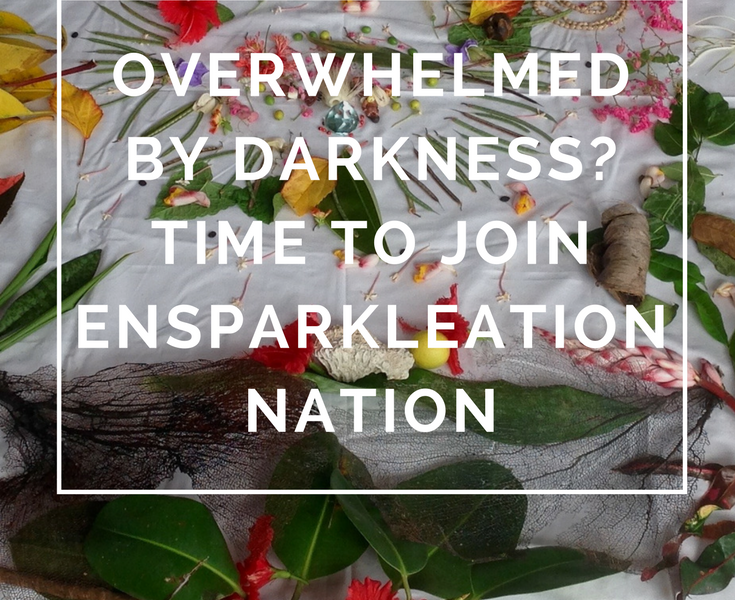 We called it the flag of #Ensparkleation Nation. In this time of chaos and uncertainty, of occupying the time beyond the tipping point (and I think this is why everyone is acting so crazy – we are going insane because we have pretty officially destroyed our planet and everyone feels that destabilization), we need to seek out connection. The ability to laugh together, to smile together, to feel connected is our medicine today. What you can do to help the whole of humanity become creative enough to somehow solve this impossible problem or adapt to what is coming, is to find out the ecology you need to shine. For me, working healthy boundaries have been hard, painful and ultimately really excellent work (I’m working to make it less painful, and mango is helping me!). 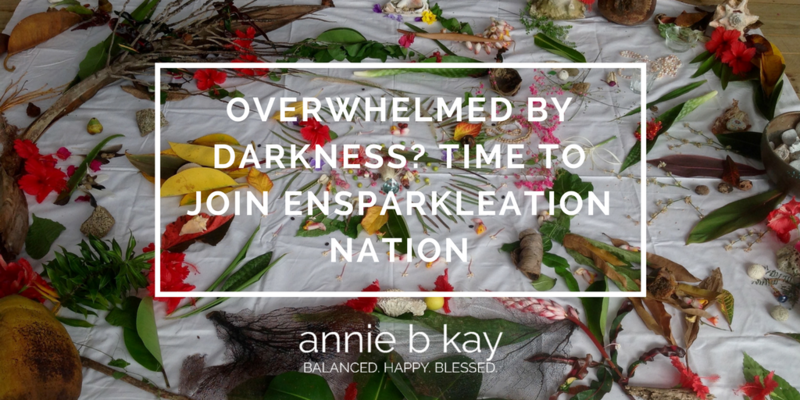 If you are feeling overwhelmed by the darkness around you, fear not. If despair is creeping in, fear not. Fear not. You need that darkness in order to shine. You otherwise would not be seen. So, what do you need to say now? What is hyper-true for you? What do you need to do to allow that unique and perfect light inside you to shine a little brighter? What a time for the great practices of radical non-attachment, of taking the next right action regardless of the outcome! Maybe the outcome doesn’t matter, not in this one moment. Join me, my friend. Breathe, smile and be, and take whatever next right step feels right for you. 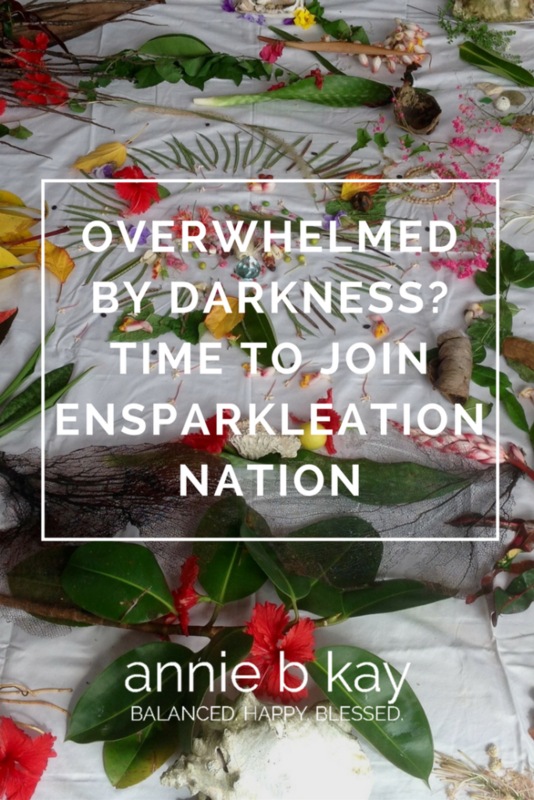 Join Ensparkleation Nation and shine with me. Not MDMA (though I do understand that when used skillfully, it can be a healer). I’m talking about life. Transcendent moments are our birthright. Moments of everyday ecstasy and wonder. 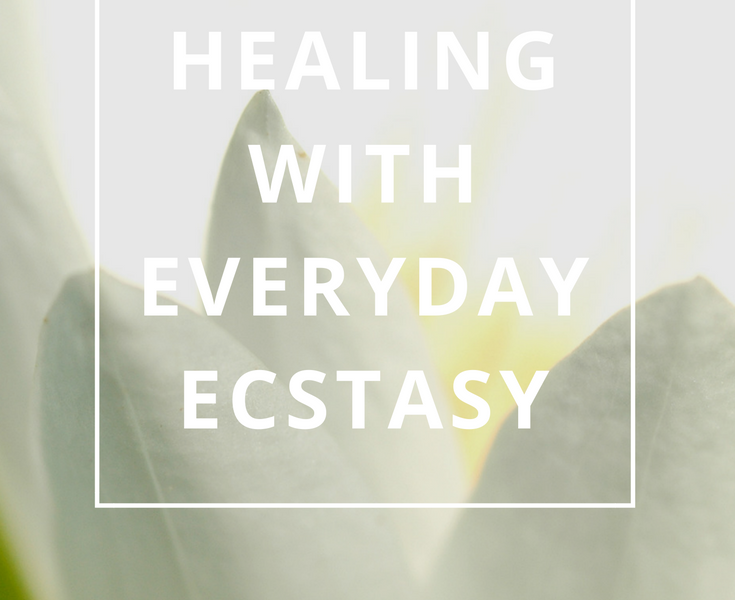 Everyday ecstasy is why I do yoga. It’s why I meditate and why I enjoy/suffer through the ups and downs of these long-term contemplative practices as my body ages, coming back over and over and over again. To taste that nectar of a momentary unitive state. The sweetness, the soma that is our birthright. Mind-body practices like yoga build resilience, in part because of how good a moment of unitive consciousness feels. It’s why I’m studying plant spirit healing and plant initiations. I learn about how plants heal through (in addition to the regular study of plant medicine) non-ordinary conscious connection. My apprenticeship in plant spirits taught me how to listen deeply to plants and nature. To find and follow the golden thread that connects us. One definition of mindfulness is focusing on something (almost anything) to the point of complete absorption. We fall into deep wonder with whatever we are focusing on, allowing ourselves a moment of ecstatic clarity. When we practice mindfulness or communion with a moment, it gives us the ability to transcend. We can transcend the muddy muck of the day and see things in a different light. Transcending is excellent for supporting healthy behavior change. And it’s fun. Ken Wilber says altered states become permanent traits through repetition and integration. I have journeyed in alchemical divinations and I have journeyed with the breath and music, with shaman and with plants. Each route is sweet and lovely and challenging and took me face to face with the wonder of this one wackily precious and miraculous life. No polluting drugs are necessary, and that’s a bit of a secret. You have everything you need to transcend right inside your own sweet little body. In fact, I find as I get older that I’m so sensitive to substances in general, that it’s just easier to go au natural. My shamanic study with plant spirit healing has been key to a certain awakening. Through this work, I’ve gotten to know a number of plants personally. To me, Tulsi is a red-haired woman with flowing green robes, a sister I go shopping with at the celestial power object store. To me, she is the full pantheon of goddesses of the yoga tradition. Yes, she’s Durga AND Lakshmi AND Kali and everyone else wrapped into one beautiful mega-goddess that if we give half a chance, might just save the entire planet, or show us the way. St. John’s Wort is golden light. If light could be a food, it would be St. John’s Wort for me. I can use the nourishment of this ally, particularly in the dark months of winter. Please be advised that what each of these plants is for me is not what they will be for you. I am not recommending them for all. This type of experience, however, getting to know a plant on a personal energetic level, bestows a different type of healing. 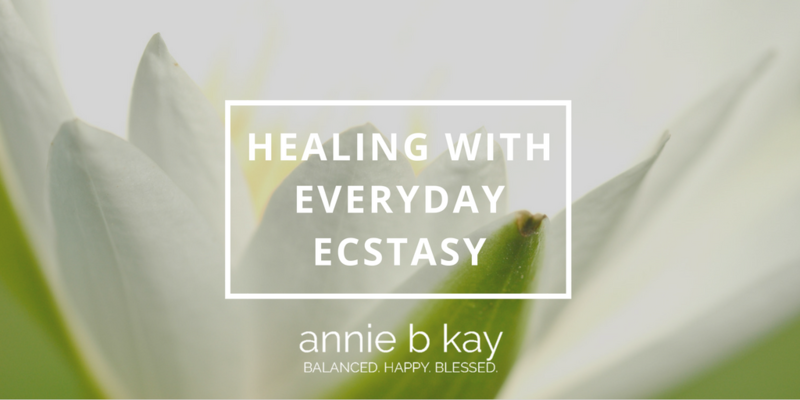 It is a type of healing much needed today: earth-centric energy healing. If this sounds a little “out there” to you, yes it is a bit. For many of you, sensation seekers and those who already talk to plants, for example, it’s not at all. 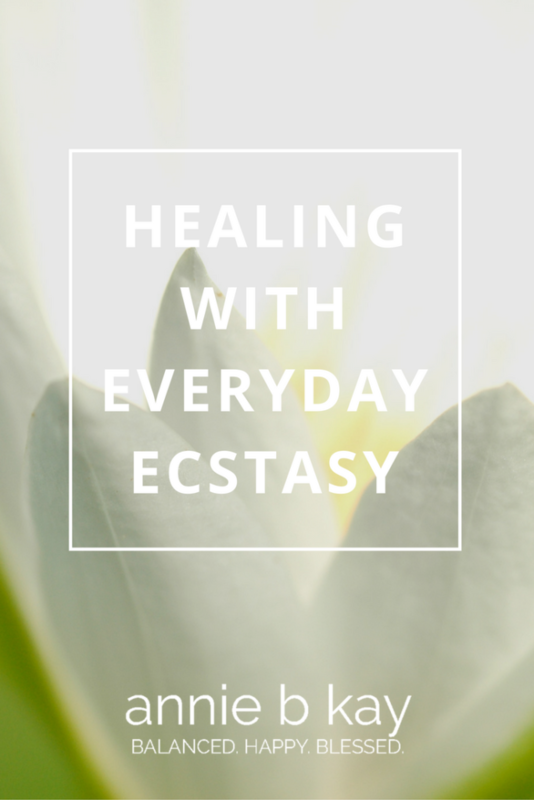 There is a growing body of science to support the healing power of everyday ecstasy. Later this year I will be offering an opportunity for you take a taste – to experience this work more deeply and see for yourself how it supports health and healing…stay tuned. Happy Holidays and remember to fall into reverie whenever you get the chance! Rituals add meaning to life. 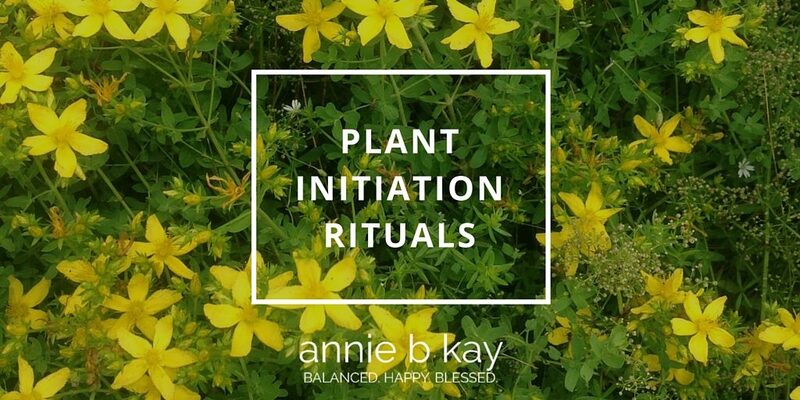 Over the past several years I have been participating in plant initiation rituals. They connect me more deeply and more coherently with nature than I have ever been. As I write this, the wheel of the year approaches the summer solstice. This day is truly filled with light. 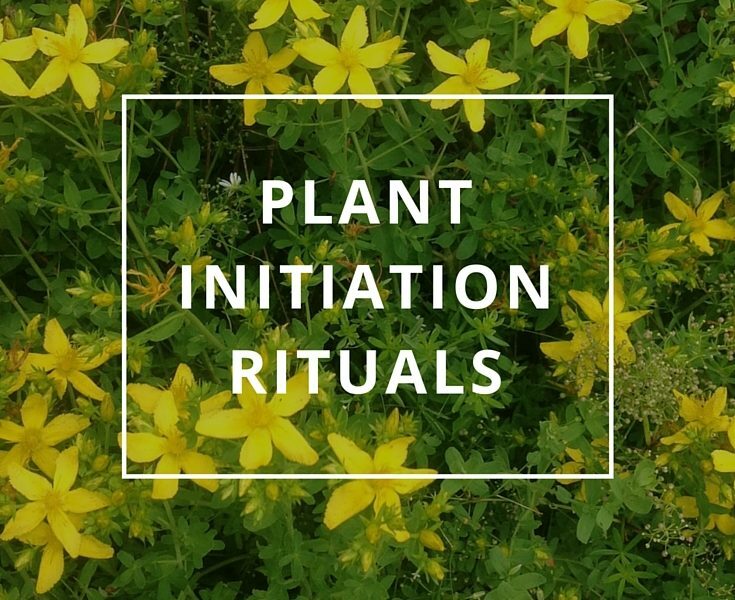 I am preparing for a shamanic plant initiation that will unfold next weekend, a gathering of plant people led by my teacher and St. John’s Wort. Plant spirit healing is a shamanic plant medicine practice that works energetically with and through plants for health and healing. 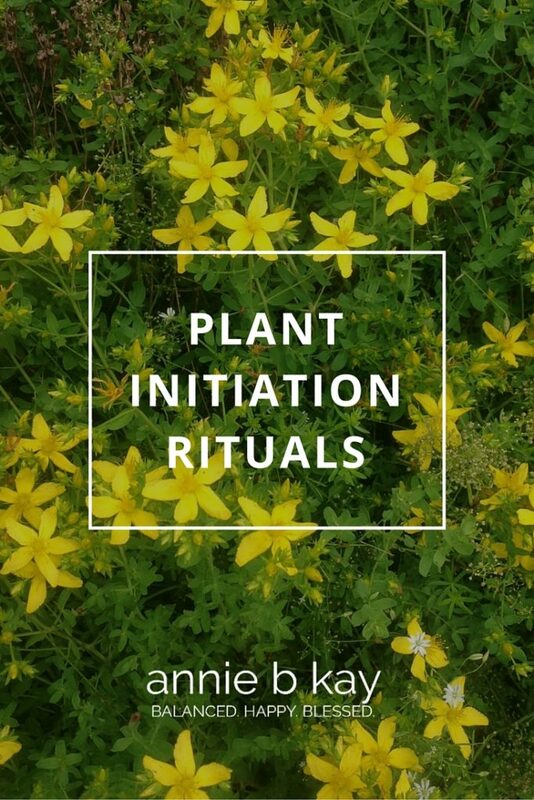 In that tradition, a plant initiation is a coming together in a ritual to honor, connect deeply with, hear and receive the healing gift of a plant. 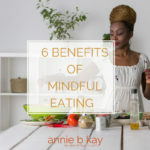 It tends to involve experiencing the plant in a variety of ways; through breath, dieting (ingesting) wonderful things prepared by the facilitator. It is done in a ceremony; with singing, fires, shamanic guided imagery journeys and the like. I have undergone several plant initiations so far and treasure this ritual experience in my life. Perhaps it’s my Catholic upbringing, filled with ritual. I was initiated by Tulsi (the green goddess!) and left with a spirit soul sister, someone to go mystery-shopping with in the cosmos. From Tulsi I learned ageless beauty and that all of the Shakti goddesses are within me – I can learn to draw upon them when needed. I was initiated by Dandelion (the indestructible grandfather guide!) at Damanhur, the eco-spirit community in Italy, and learned steadfast resiliency and impenetrability of spirit. Now it is St. John’s, and I already have a close relationship with the bestower-of-light. I hope to burn off a bit of dross and am open to an enlightening experience! Bless you and may you have your own nature encounter today. Tell us about it! We live in a culture dominated by our heads. That’s made our lives pretty stressful. It doesn’t need to be that way. A number of writers and teachers are working with concepts of energy coherence. While the science is early and evolving, the concept and practice is profound and it resonates with students. 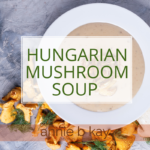 I have learned about coming into syncronicity on an energetic level as a means of tapping into my own internal wisdom, and to connect deeply with plants and nature. It’s fun and it works. Head thinking and heart thinking are different. The head is a master at figuring out the best way to get from point A to point B, of calculating linear questions But please don’t give the head a question that doesn’t have limits, like “what should I do with my life?” The head is all about safety and risk aversion. Rather, use your heart for those questions of whom to marry, how to follow your bliss, or to connect more deeply with people and things around you. Learning how to use and balance these 2 amazing organs in our bodies and lives is one of the primary practices of leading a skillful integrated life. The folks at the Heart Math Institute have been working on the science of honoring our hearts as a primary organ of perception for decades. Our human bodies contain a powerful oscillator – an organ that creates electronic frequency or a wave. You guessed it, it’s our heart. When waves come into coherence, waves amplify each other. Guess which emotions tend to bring our hearts and therefore our human bodies into coherence with nature? You guessed it again – gratitude and appreciation. When we create coherence with nature, we can hear it, feel it, and experience it more deeply. To me it feels like experiencing nature from the inside. It feels like I am connecting with a tree the way I connect to my grandmother – like a friend from way back. It feels wonderful and as it turns out, is big medicine for my body. And THAT’s how you connect with plants and nature. By learning how to communicate with you heart. THAT’s what I learned from my wise and gracious teacher Pam Montgomery, and that’s what we’ll be teaching you over the 4th of July weekend at Kripalu! Time to sign up, lovelies. Enrich your life, feel your integral place in the amazing and gorgeous web of life. Good food, good people, good work. See you there. 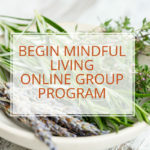 Here’s another practice for Deepening your connection to Gaia (mama earth).